This week is Road Safety Week, an invaluable initiative for keeping our roads as safe as possible, organised by the road safety charity Brake. 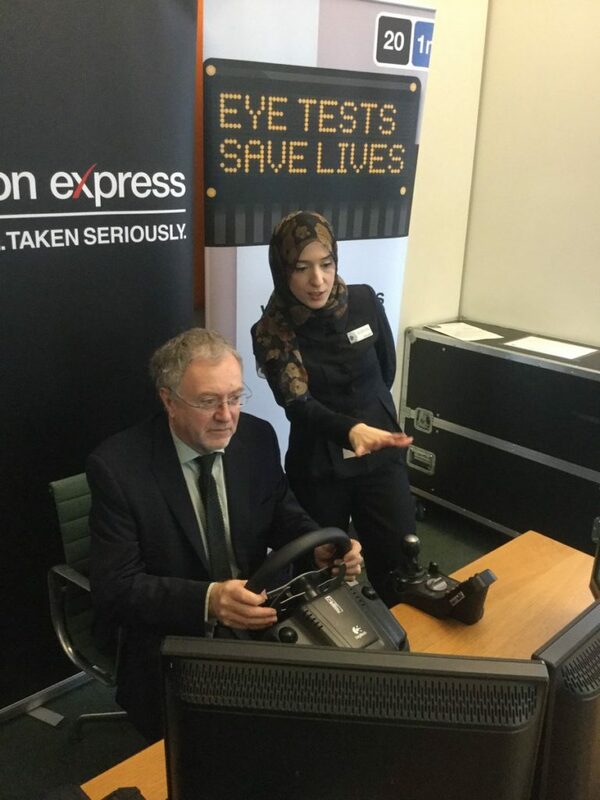 As part of Road Safety Week, I took part in an event organised by Vision Express and Brake to try out a simulator that replicates the impact of glaucoma on a driver’s field of vision in order to highlight the importance of regular eye testing for road safety. Deterioration of eye sight can be gradual and often people won’t realise that their vision has deteriorated over time – in fact 40% of your vision can be lost without you even noticing. Regular eye tests help to pick up changes in sight to ensure that problems can be treated to help prevent a deterioration in eye sight. Across the UK, over 2 million people are living with sight loss, 50% of which is preventable and could be addressed through regular eye check-ups. It is a similar case for glaucoma, the single biggest preventable cause of sight loss – half of people living with glaucoma are undiagnosed – yet this could immediately be detected by an eye test. Eye tests really do safe lives. Road crashes caused by poor driver vision are estimated to cause 2,900 casualties in the UK a year. Every person killed or injured on our roads is one too many. We all have a responsibility to identify what more we can do to make the vision of zero deaths and serious injuries on our roads a reality. Over 1.5 million licence holders have never had an eye test and all drivers have a responsibility to ensure that they regularly get their eyes tested. The NHS recommend that you should get your eyes tested every two years, and more often if advised. Not only does an eye test check whether you need glasses, it can also identify a number of underlying health conditions, and makes our road safer for everyone.